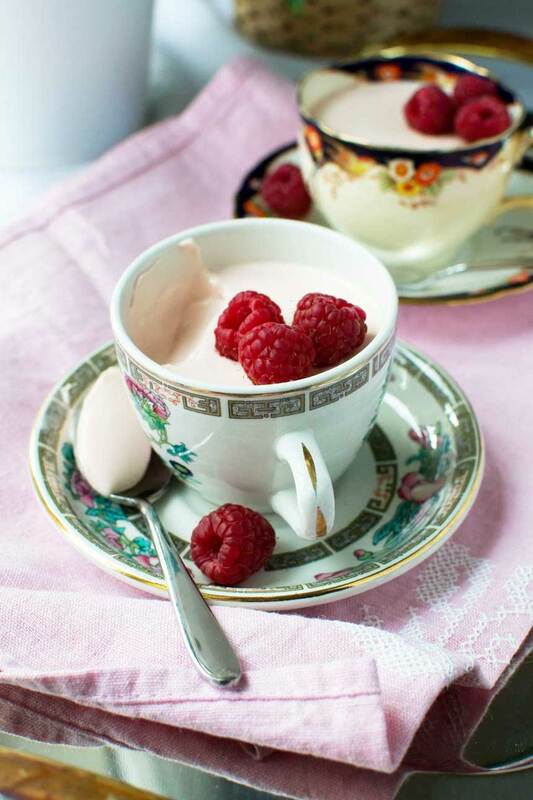 You won’t find an easier little elegant dessert than this raspberry Greek yogurt panna cotta. 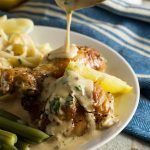 It’s make-ahead, it takes minutes to make, it contains only 3 ingredients and would be perfect for Valentine’s Day or any other classy occasion. I’m generally not a fan of creamy desserts, much to Mr. Scrummy’s disapproval as the poor thing (??) never gets made the desserts laden with cream that he loves. Pavola, trifles, cream cakes and the like are all off the menu at our house. Well, when I’m making anyhow. Every now and again he likes to have a little moan about how everything sweet I make is either chocolate or lemon based. Which is sort of true, but then I remind him that he knows where the kitchen is and is welcome to make these desserts for himself! But for some reason I find panna cotta (literally ‘cooked cream’ in Italian) absolutely delicious. Strangely, I enjoy the rich creamy taste, but it’s also something about that slightly wobbly, not-too-hard-not-too-soft silky texture. It’s perfect. What’s in a panna cotta? Traditionally panna cotta includes gelatin, water, cream, and sugar. But I decided to try and simplify it a bit. So after a little bit of research to check that the idea might work, I decided to give a raspberry panna cotta a try using packaged jello (that’s jelly to us Brits! ), and Greek yogurt to keep thing on the lighter side. We’re not talking super skinny because I did still add a bit of cream. The first time I tried out the recipe I used milk to see if that would work, and ended up with a nasty cheesy curdled mess (oops). But if you first melt the jello into the cream, then slowly stir in the yogurt, you end up with a perfectly smooth, perfectly pale pink, texture. Not a lump or clump in sight! If you’re a fan of easy desserts, this one’s for you! This is another one of those recipes that hardly needs a recipe. Don’t you just love those? 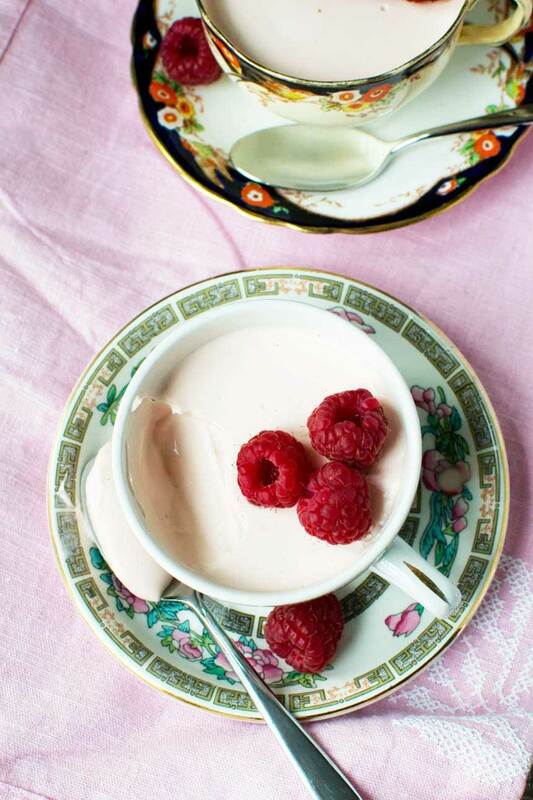 Honestly, this raspberry Greek yogurt panna cotta takes mere minutes to make. And only an hour or two to set in the fridge. I couldn’t help but think that it would make a perfect simple Valentine’s Day dessert. Prepare it a few hours ahead, or even the day before, to leave yourself more time to concentrate on your main course… or on enjoying the romance with your other half! These 5-minute chocolate pots never disappoint! 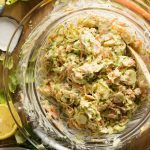 They’re classy, you can make them way ahead and pop them in the fridge, and best of all they take just minutes to throw together! I’ve never met anyone who didn’t love this 6-ingredient gooey Swedish chocolate cake. Make it in a round cake pan, or turn the recipe into brownies! 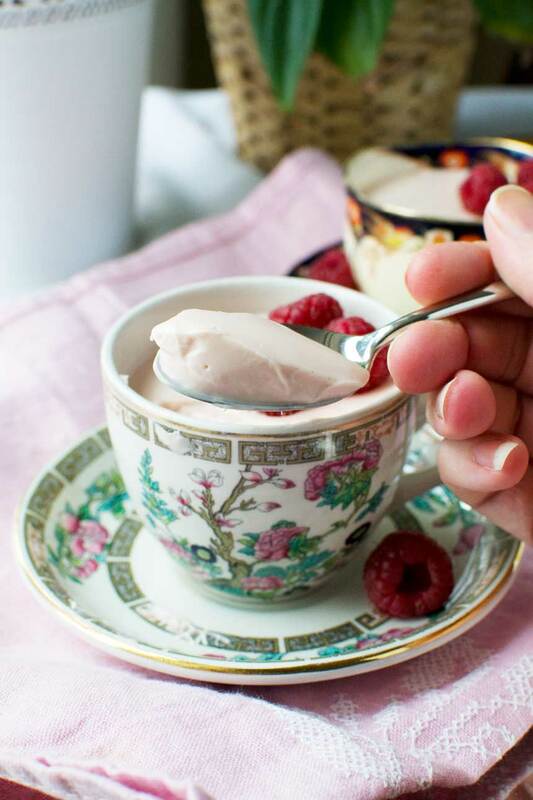 This raspberry Greek yogurt panna cotta couldn't be easier... or classier! 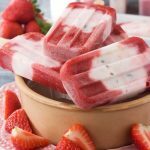 Made with only 3 ingredients - jello, cream, and Greek yogurt, it's a perfect make-ahead choice for Valentine's Day or any other special occasion. Melt the jello/jelly cubes into the cream in a saucepan on a low to medium heat. *I used half a 135-gram pack of jelly cubes (in the UK). I've attempted to adapt the recipe for the US (I understand jell-o is sold as powder/gelatin mix there, not cubes as in the UK). I'm pretty sure this will work just as well using the jell-o powder, but please let me know if it doesn't and we'll think again! You can play with the amounts of cream and yogurt, so long as you use about 300ml / 1¼ cups altogether. Don’t like too much of a yogurty flavour? Just replace some of it with more cream! Of course, you can also experiment with different jello/jelly flavors. How about strawberry, lemon, or passion fruit? 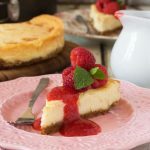 Haha – Helen – somehow I find it hard to believe that you are a “wicked wife” – I mean you made this creamy decadent and easy dessert – loving the idea of jello and yogurt – I’m wondering we have jello powder here – would that work? Thanks for sharing and hope your week is off to a wonderful start! Hi Shashi – thanks for pointing out that you have jello powder in the US – it certainly would work and I’m just about to update the instructions! 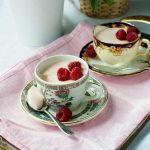 This would be such a cute Valentine’s Day dessert and panna cotta is one of my favorite desserts. I love your teacup presentation. What a delicious and fun dessert! Can’t wait to try it! Perfect for Valentine’s Day! Easy and I love your pretty little tea cups that you presented the panna cotta in. Thanks Karen! I’m just about to update the recipe for the US – just realised (curtesy of another reader!) that jell-o is sold differently in the US and UK! Hi, … am mystified as to what ‘jelly cubes’ are….any American substitutions? Thanks in advance…so looking forward to making this for my upcoming Thank ‘Ewe’ tea party! These are so adorable! Especially on those cups! And hehe yes they are welcome to fix their own thing. Thanks, Lorraine. One day though I WILL try making that pavolva for him. I bet you’ve got a great recipe somewhere on your blog! Comment résister à ce beau dessert si joliment servie!? C’est tellement beau à regarder que forcement doit être très bon aussi! 🙂 Merci, Eva! J’adore les petites tasses, et je sais pas pourquoi j’ai pas pense a les utiliser comme plats avant!